7group is a collaboration between close friends which happens to be a business. We share a vocation – using our experience with green building as an instrument for developing the capacity of people to affect how humans regenerate life through building. We have worked on some of the “greenest” building projects in the world, but this alone is not enough. We seek to use each unique project’s design and construction process as an instrument for affecting the larger living systems in which that project is nested. As such, we work on developing each unique human’s capacity to play their role (and manifest their essence) in service to the vitality and viability of all life in that particular place. We see this as a process of reciprocity that seeks to grow and develop potential in each and all entities nested within the whole. We have found that the most effective nodal point for actualizing such systemic transformation is working on how we, as humans, are thinking about our role on the planet. We believe that all of us want to make an positive impact on the world. In all humility all we can generally expect is to make a small dent. At our core 7group has been working together for over 20 years to use the “process of building” as an instrument for empowering systemic change in how humans live and inhabit our world. While our focus has expanded from technical systems to living systems, our aim remains the same. We explore connections, and develop interrelationships, that promote holistic affects. The trajectory of our thinking has led us to the obvious conclusion that humans need to re-member our contributory role as co-evolutionary participants in the council of beings, nurturing and contributing to the health of all life. Beyond ourselves . . . people come alive and regenerate energy when contributing to the greater good by working on what they really care about. The process is the journey, it’s all about the journey. 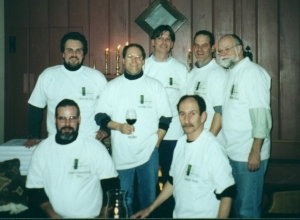 Our journey began more than 20 years ago with a focus on system thinking and an integrative process. 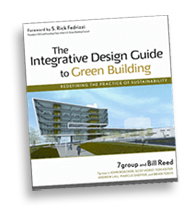 We wrote a book on the subject with Bill Reed in 2009 that has become the definitive guide to the integrative design process as applied to green building projects. A successful sustainable, or green, project is a solution that is greater than the sum of its parts. By intentionally building connections and cross-linked support between the engineered, cultural and natural systems present in all building projects, significant efficiencies, as well as natural system regeneration, can be achieved. Project and operating costs can also be reduced. Simply adding or overlaying individual “environmental” systems in isolation will not allow buildings and communities to benefit from the available connections and interdependencies that can be identified in an integrated, or whole system, design approach. This is the fundamental challenge of sustainable design. The core concept of integrative design is simple – most everything in a building project affects everything else. Consequently, we examine how to integrate site parameters, solar orientation, water, stormwater systems, thermal envelope, lighting, window performance, heating and cooling supply systems, ventilation, and air distribution in a way that all of these systems are working together, much like those within an organism. This design methodology constantly examines the tradeoffs between the up-front costs for pursuing the project goals and the benefits that are derived from achieving them. Design decisions are based upon analyzing, quantifying, and evaluating the synergistic interactions between building systems. Unlike conventional design, though, integrative design mandates closer interaction among the owner’s representatives, architects, engineers, and operations staff while they work together from the earliest pre-design phase to evaluate measures that can produce overall project savings, higher performance, and environmental benefits. We will initiate this interaction at the very beginning of this project by convening a goal-setting session with all stakeholders, followed by a focused and collaborative design charrette with all team members. All projects have great potential for incorporating the most advanced green building design techniques and systems. However, there can a cost to pay in terms of budget as well as untested techniques; technically feasible solutions may not be right for operational simplicity and budget. Part of our job is to help find an optimal balance between the economic, cultural, and ecological areas of sustainability that will meet the objectives of our clients, yet allow for future adaptation of new technologies and interactions with the community. Our approach is one of common sense application of thoughtful and integrated solutions. While we still apply an integrative process to all of our work, the epilogue to the book, Evolving the Field, foreshadowed when we were headed. The book ends with the question, “Where do we stop integrating?”. While working this way we discovered that applying an integrative process to technical systems was not enough. Our focus needed to shift from seeing buildings as the outcome, to buildings as a developmental instrument to achieve a larger purpose. The process requires an aim or direction toward regenerative, living systems. Each particular place is alive, unique and evolving. If we want to flourish over time, we must understand that we are in mutually beneficial relationship with each particular place and that humans play a participatory role in the vitality of the living systems in which we are nested. The basis of regenerative whole-systems approach lies in understanding that role through understanding the uniqueness of each place we live and work – and what created and continues to create that unique identity. The cultural environment we call a community is a living system composed of many complex cultural and natural systems that form a web of mutual support. The health of cultural (and economic) systems is ultimately dependent on the health of natural – or living – systems. Regeneration is rooted in the belief that healthy living systems have an inherent capacity to continually generate new sources of life for and within themselves and their environment – i.e., to re-generate. This work is grounded in a philosophy that humans (and human activities) are not apart from the development and ongoing evolution of such healthy living systems; rather, humans serve a participatory role in their continuing viability and vitality. Through the practice of developing how we are thinking in this way about whole living systems, any project can be leveraged as a highly effective acupuncture point for helping transform community vitality and regenerating life. Regenerative Development and Design comprises a meta-discipline that combines the pattern thinking and practices of Ecological Design, Permaculture, Biophilia, Organizational Psychology, Neuroscience, and Integrative Design. The purpose of regenerative development and design is to facilitate and guide the evolution of a place toward its highest creative and productive potential in a way that explores its unique nature and capacities (essence), so that planning and design efforts improve the capability of all living systems (including the larger whole-system in which each place is nested) to evolve towards higher levels of vitality and viability indefinitely. Through a series of workshops, participants experience this work through highly interactive engagement and discussion around how building and development can be seen as an instrument for healing, sustaining, and regenerating the community of life in each unique place by re-membering that we play a participatory role in the vitality of the living systems in which we are nested. The process of working on projects from this whole living-systems perspective shifts the focus of everyone’s attention from simply solving problems and working only on “things” (such as buildings) to seeing any such project as an instrument for working on realizing the highest creative potential of the larger systems in which the project is nested (and inter-dependent). This shift in focus builds an understanding of the particular nature of each unique community/place and the particular reciprocal interrelationships (between human and “natural” systems) that create that uniqueness. 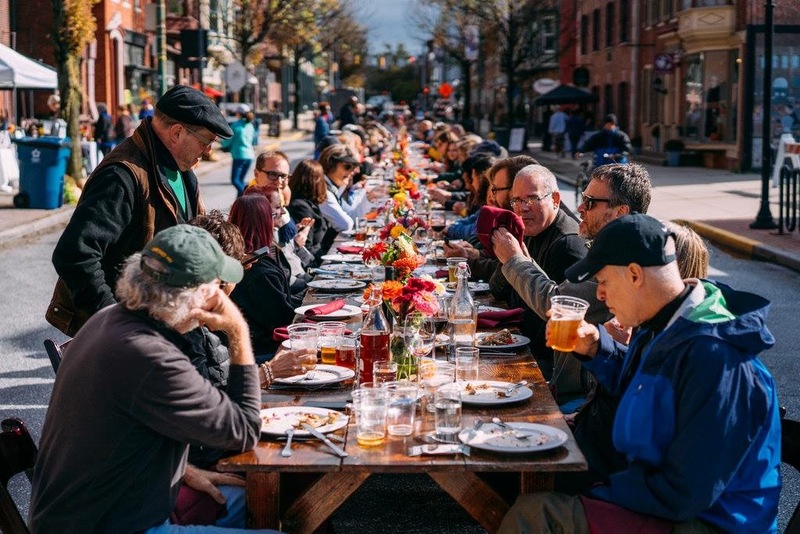 Working in this way awakens a deep and caring sense of place and meaning that becomes transformational by serving as the source of new community spirit and individual Will grounded in what people really care about. Communities all over the world currently engaged in this process are reconciling longstanding deep divisions, improving the quality of life for all inhabitants (all species), and delivering real value to all stakeholders by collaboratively co-creating processes of reciprocal exchange aimed at the health of the whole, not just the pieces. Prior to forming 7group the original partners brought divergent but complimentary skills and experiences to the partnership. Alan – was a lawyer by training. He has an amazing ability to be a catalyst and convener to jumpstart worthwhile enterprises. 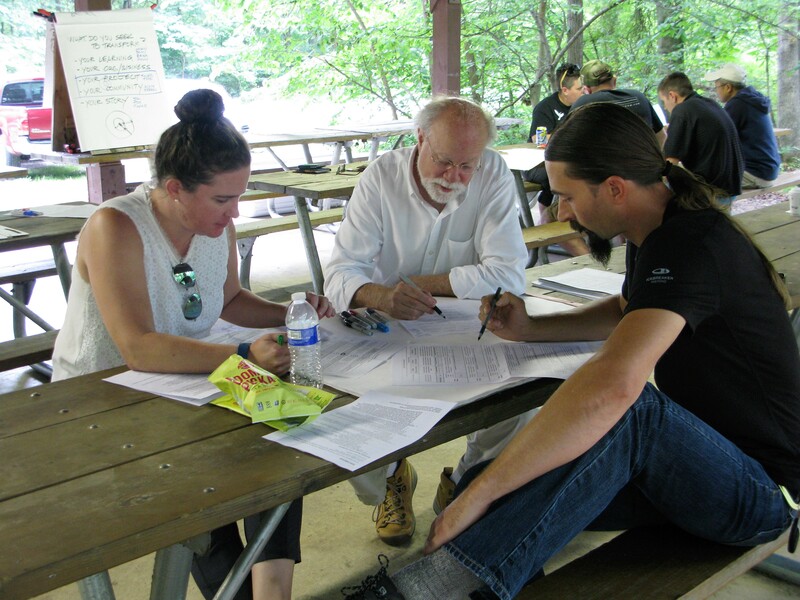 He was actively involved in the central Pennsylvania region in assisting non-profits and institutions by bringing consultants and funding together to promote greener buildings. P.S. – Alan left 7group to become the Assistant Attorney General in Saipan and is currently Assistant General Counsel at the Washington, DC Department of Energy & Environment. John – had worked in Connecticut, LA, Pittsburgh, and the Harrisburg area (for 14 years at the time of 7group’s founding) as an award-winning design architect focused on aesthetics and beauty. P.S. He experienced a bit of an epiphany in 1996 when he realized that focusing primarily on the aesthetics of building was leading to making decisions that deeply affected our environment in multiple negative ways . . . and that by expanding his and his teams’ focus and attention to addressing our larger ecology, even more beauty emerges. Scot – was a classically trained opera performer. He also had been designing and making custom furniture for clients in New York City. He formed his own company in 1992 making VegTables and establishing his knowledge of green materials. P.S. – Scot later became the Senior Vice President at USGBC in charge of the LEED Green Building Rating System and is now the CEO of ARC Skoru. Tom – was a Professor at Penn State who had founded and owned an award-winning film making company in State College, working for a wide range of national and international clients. P.S. – Tom worked at Penn State Public Broadcasting and continues to make films as a collaborator in storyshop films. Marcus – has an environmental studies degree and a passion for developing solutions to environmental issues. For 12 years he had worked for the Pennsylvania Energy Office (PEO) and had formed his own energy consulting firm, Energy Opportunities (EO) in 1993. Marcus and Andy had been working together on solar energy and energy efficient buildings since 1984. P.S. – more of the same with a deeper environmental focus. Andy – had been working on solar energy and energy efficient buildings since 1977. Andy was a professor of engineering at Penn State Harrisburg and worked on projects with the PEO and on energy modeling of several buildings with EO. P.S. – Andy is an engineering professor at Penn State University Park teaching first-year design and sustainability. Brian – a former student of Andy’s, began his career in HVAC design in 1987 and was always interested in “sustainability”. Brian had started his own mechanical engineering and design firm, BETA Engineers in 1997. P.S. – Brian’s firm transitioned their work into the then emerging field of building commissioning. On December 12, 1996 a meeting was convened to discuss the possibility of greening the upcoming Pennsylvania Department of Environmental Protection’s (DEP) South Central Regional Office Building (SCROB) in Harrisburg. Alan Barak was promoting green building in the Commonwealth under a grant from the Heinz Endowments. He had a personal connection with the sister of the developer charged with building the project, so he was able to arrange the meeting. He then contacted Steve Lee, an architectural professor from Carnegie Mellon University, and Marcus Sheffer, an energy/environmental consultant, to arrange for them to assist him in pitching this new idea to the project team. John Boecker as the project architect, was also in attendance. The outcome ostensibly appeared somewhat predictable, since greening the project seemed to align with DEP’s mission, but Jim Toothaker, DEP’s Director of Building Systems and the person in charge of the project for DEP, responded by crossing his arms during most of the meeting clearly expressing his skepticism. However, Jim knew common sense when he heard it, and so he made the visionary call to “go green” . 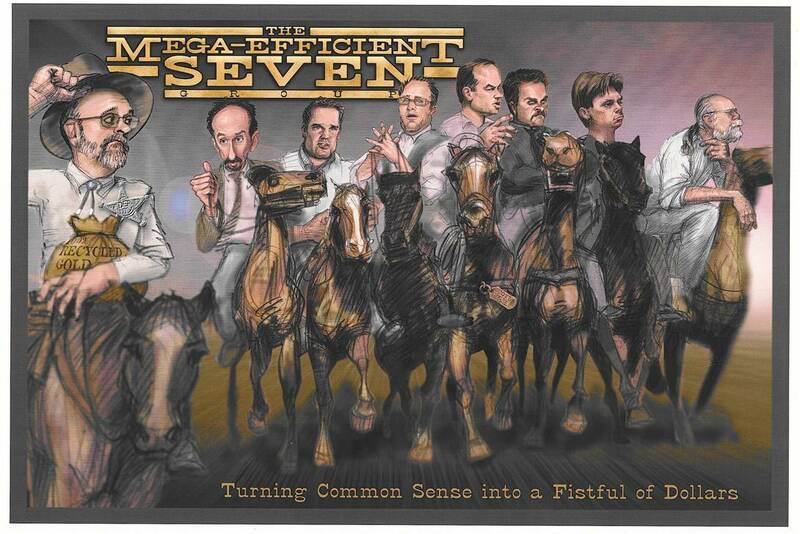 . . and 7group was born. The project ended up being one of the first 12 LEED Certified projects in the world. From this origin, additional future partners in 7group worked on the SCROB project including Scot Horst, joined the team as the “green materials guy”; his research and skill resulted in his installation of green materials materials primarily in the lobby. Tom Keiter joined the team and was charged with producing a video about the project entitled Pennsylvania’s First Green Building. The SCROB project was followed in succession by the PA DEP Cambria Office Building project in Ebensburg, PA. John was once again the project architect, Scot served as the green materials consultant, Tom made another series of videos, Marcus served as the energy consultant and brought in Andy Lau to do the project energy modeling. Andy in turn introduced us to Brian Toevs, who did the building commissioning. More DEP projects followed and the future 7group partners began working together more and more frequently. 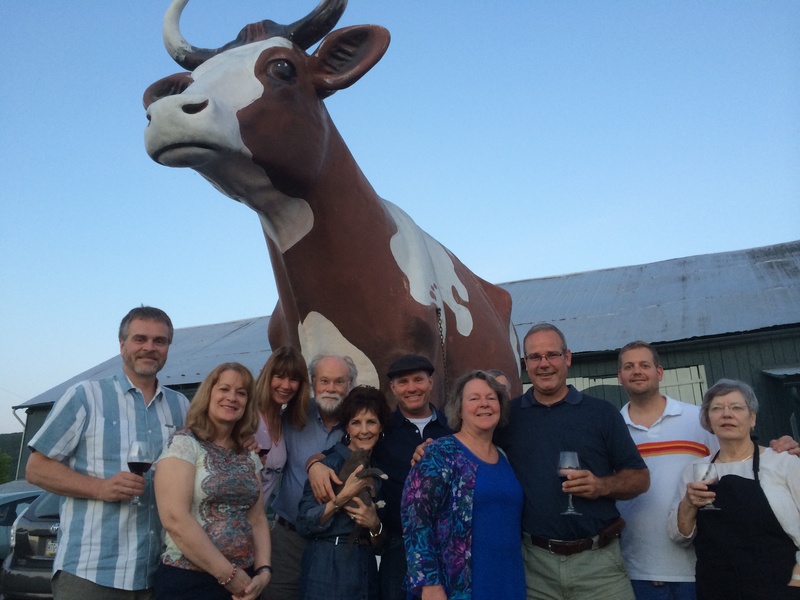 Business relationships soon became personal friendships. Once again serving as a catalyst and convener, Alan brought us together (over a beer at the picnic table in his backyard) and suggested we form a business partnership. We all said “Of course, why not?”. John Boecker is an Architect, and as a founding partner, he helped develop 7group as an internationally recognized multi-disciplinary consulting firm focused on integrative design and regenerative development. His practice has focused exclusively on sustainability and regeneration since 1996. Along with his 7group partners and Bill Reed, he co-authored The Integrative Design Guide to Green Building, a seminal book published by Wiley in 2009. He served as Project Architect for two of the first 15 LEED certified projects worldwide and as primary LEED/Integrative Design Consultant on over 100 additional LEED certified projects in eight countries. His design work has been recognized by over 40 design awards, including 25 Design Excellence Awards from AIA, three Pennsylvania Governor’s Awards for Environmental Excellence, and AIA’s nationwide Top Ten Green Projects in 2000, 2009 and 2016. As a highly sought keynote speaker, John has facilitated workshops on the benefits of integrative design and regenerative development in 35 states and 14 countries. Tom Keiter has over 30 years of experience as a communications consultant, filmmaker and developer of multiple media communications tools. He is a founding partner in storyshop, LLC, a documentary production group and has been producing for public television and independently. He has produced numerous projects on green building and sustainability issues, including Pennsylvania’s Building Green in PA program, a series of DVD tools, including Lessons Learned, first utilized in USGBC’s LEED Training Workshops. A partnership with Rocky Mountain Institute produced a two-program High Performance Building series, Perspective & Practice and High Performance by Integrative Design. He originated the nationally distributed public television project Water Blues, Green Solutions, which was a follow-up to Liquid Assets, both focused on water. His work has received four Emmy Awards, as well as recognition in the International Film & Video Festival, CINE Golden Eagle, the Communicator Awards, and the Engineering Journalism Award from the American Association of Engineering Societies. Energy consumption and production is at the core of virtually all environmental impacts. Focusing on these issues is how Marcus Sheffer has developed a national reputation as a leader in energy management, efficiency, conservation and renewables. After 12 years at the Pennsylvania Energy Office, he founded Energy Opportunities, Inc., and provides technical consulting services on building energy issues, renewable energy systems and the environmental impacts of human enterprises. He also operated the York County Community Foundation Energy Program for 20 years, providing technical assistance to local nonprofits. A teacher and author of the Pennsylvania Solar Manual and co-author of The Integrative Design Guide to Green Building, Marcus has also held numerous volunteer positions with USGBC, ASHRAE and the International Living Future Institute. He is a LEED Fellow and Living Future Accredited. His training in environmental studies brings a unique perspective aligning with his current focus on learning and sharing the broader implications of regenerative design. When it comes to commissioning, Brian Toevs, P.E., is hard-wired for the task. As founder and president of BETA Engineers, PC, his 30 years experience in building systems design has given him hands-on expertise in building subsystems ranging from fire protection, dust collection and sanitary sewer to process piping, ventilation and HVAC. He took that expertise and began doing commissioning work more than 15 years ago, and hasn’t looked back. He is a widely respected commissioning agent, serving that role for a wide range of facilities, including government office buildings, correctional facilities and schools, along with commercial office buildings, hospitals, industrial facilities and wastewater treatment facilities. As a noted building forensics investigator, Brian specializes in cause and origin investigations. Bill is an internationally recognized practitioner, lecturer, and leading authority in sustainability and regenerative planning, design and implementation. His focus is to lift green building and community planning into full integration and evolution with living systems. His work centers on creating and implementing a whole and living-systems design process. The benefits of this process include higher efficiency, lower costs, reduced waste, faster time to market, and the realization of exponential value to the social, ecological, financial and human qualities of a project, the community and its ecosystem. He is an author of many technical articles and contributed to many books including co-author of the seminal work, “Integrative Design Guide to Green Building.” He is a founding Board of Director of the USGBC and one of the co-founders of the LEED Green Building Rating System. In addition to being considered one of the leading thinkers in this field, he has also consulted on over 200 green design commissions, the majority which are LEED Gold and Platinum and Living Building Challenge projects. He is also a keynote speaker at major building and design events as well as a guest lecturer to universities throughout Europe and North America including Harvard, MIT, Princeton and UPenn. Cristina Argeles is Vice President of West Main Consultants, LLC, a 7group company, where she focuses on project management, development and implementation. She is an expert in the USGBC’s LEED green building rating system, serves as the liaison to USGBC for 7group’s LEED certification reviews contract, serves as a technical reviewer for certifications, and works with clients interested in pursuing LEED certification for their building projects. She also assisted in the development of the Cool Climate Concrete (C3) Program, a carbon offset program using blended cements as a carbon mitigation strategy. She earned a Master of Environmental Management degree from the Nicholas School of the Environment at Duke University and a BS degree in biology and environmental sciences and policy from Duke University. Lura Faust is the senior operations coordinator at West Main Consultants, LLC, a 7group company. She coordinates all financial, management, marketing and human resource affairs for nine different companies including 7group. Lura coordinated all the behind the scenes efforts throughout the publication process of 7group and Bill Reed’s seminal book, The Integrative Design Guide to Green Building, published by Wiley in April, 2009. She also helped develop the Monitoring and Verification Plan for the Cool Climate Concrete (C3) Program, a carbon offset program using blended cements as a carbon mitigation strategy, and implemented the program successfully retiring more than 406,000 metric tons of CO2 offsets. Lura earned her BS in Business Administration with a concentration in Accounting from Kutztown University in 2004. Alvin Changco is President of West Main Consultants, LLC, a sustainable materials consulting firm and a 7group company. He manages client projects pursuing LEED certification and reviews certifications under the USGBC’s LEED green building rating system. In addition, he provides intellectual property and general corporate legal services with a particular focus on developing property right issues in international carbon emissions programs and policies. Alvin earned a Juris Doctorate degree from Villanova School of Law, a Masters of Science degree from Case Western Reserve University in the Department of Biochemistry, and a BS degree in biochemistry from Albright College. Sol Lothe is a LEED Consultant with West Main Consultants, LLC, a 7group company, where he reviews certifications under the USGBC’s LEED green building rating system and manages client projects pursuing sustainable and green building strategies. He earned his BS in Architecture from Penn State where he was involved in the 2007 Solar Decathlon and the American Indian Housing Initiative. Gerren Wagner is a LEED AP with Energy Opportunities, Inc., a 7group company, specializing in energy and environmental consulting services. Her main responsibilities include reviewing LEED certification documentation for USGBC, managing the coordinated completion of LEED certification reviews within the office, and performing general office management tasks. Gerren earned a BS in Spanish from the Indiana University of Pennsylvania and is currently completing coursework towards a degree in Structural Design and Construction Engineering Technology at Penn State Harrisburg. Tyler Thumma is a Mechanical Engineer who joined Energy Opportunities, Inc., a 7group company after completing his BS in Engineering at Messiah College. Tyler uses energy modeling to simulate the energy performance of commercial building designs, estimate the impacts of alternative design strategies, and for the purpose of Measurement and Verification (M&V), often for projects pursuing LEED and/or Living Building certifications. He conducts energy audits and performs utility billing analysis to make recommendations for implementing energy cost saving measures. He also reviews the technical energy and indoor environmental quality credits for projects seeking LEED certification. Misty Steinert is a financial manager with West Main Consultants, LLC, a 7group company, where she maintains financial records for four different companies, coordinates general office administration and assists with human resource administration. In addition, she coordinates certification reviews under the USGBC’s LEED green building rating system. She also assisted with the verification of carbon offsets through the Cool Climate Concrete (C3) Program, a carbon offset program using blended cements as a carbon mitigation strategy. Carrie Platusich is an energy engineer for Energy Opportunities, Inc., a 7group company. She is primarily responsible for simulating buildings’ energy performance in order to evaluate the impact of design decisions, and she also reviews the technical energy and indoor environmental quality credits for projects seeking LEED certification. Prior to her energy career, Carrie was an HVAC design engineer who worked on A/E project teams serving clients in the Transportation and Science & Technology markets. She has a BS in Mechanical Engineering from Washington University in St. Louis and is a LEED AP. Holly Griffin is the Bookkeeper for Energy Opportunities, a 7group Company. She manages the accounting portion of the business transactions and makes sure everyone gets paid. She also assists with the organizational logistics of managing the review of LEED Certifications. Holly has a BS in Business Administration from Penn State and an MBA in Business Administration from York College where her focus was on Lean Manufacturing and Statistical Analysis. She is also CPIM certified for Inventory Management.